Recently, I was asked to make a program for printing some data to a small or handheld Bluetooth printer device. This can be used for printing receipts, simple tickets, or customer notes. I like how it works because usually, we are getting our program output on a computer screen. But this time we are getting our output on a tangible paper! This code will simply let you connect to the Bluetooth printer, type a text that you want to be printed and click the “send” button to print. As for the printing with images, we made another code for that, please see section 4.3 (April 15, 2015 update) below! Step 1: Put the following code on your MainActivity.java. These imports are needed to perform our Android printing operations via Bluetooth. Step 2: Inside your MainActivity class will be the following variable declarations. Step 3: After the variable codes, we will have the following onCreate() method. Step 4: Our XML layout file called activity_main.xml located in res/layout/ directory will have the following codes. Step 5: Inside the try-catch of your onCreate() method we will define the TextView label, EditText input box and buttons based on our XML layout file in Step 4. Step 6: We will set the onClickListener of our open button. 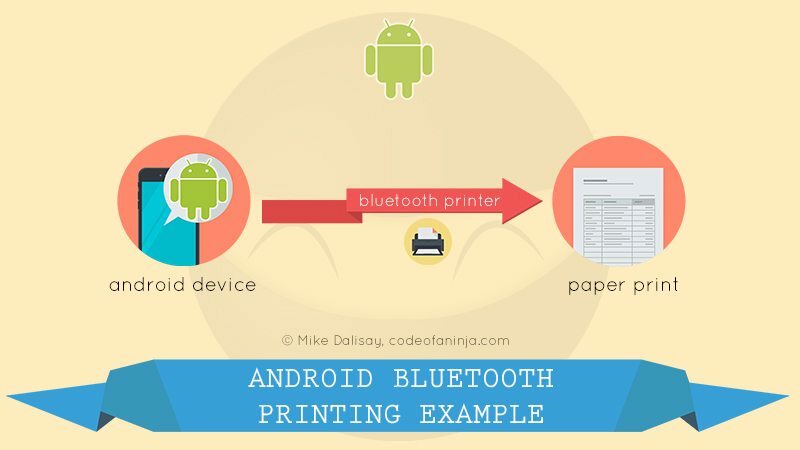 This will open the connection between the android device and Bluetooth printer. Step 7: findBT() method will try to find available Bluetooth printer. It will not work without the following code. Put it below the onCreate() method. Step 8: openBT() method will open the connection to Bluetooth printer found during the findBT() method. It will not work without the following code. Put it below the findBT() method. Step 9: We need beginListenForData() method so that openBT() method will work. * we have to listen and check if a data were sent to be printed. Step 10: We will make an onClickListener for the “Send” button. Put the following code after the onClickListener of the “Open” button, inside onCreate() method. Step 11: sendData() method is needed so that the “Open” button will work. Put it below the beginListenForData() method code block. Step 13: closeBT() method in Step 12 will not work without the following code. Put it below the sendData() method code block. // close the connection to bluetooth printer. Step 14: Make sure the BLUETOOTH permission was added to your manifest file. It is located in manifests/AndroidManifest.xml, the code inside should look like the following. Step 2: Type any text in the text box or EditText. Step 3: Click the “Send” button, Bluetooth Printer device will print the text you typed in Step 2. Step 4: Click the “Close” button to close Bluetooth connection and save battery. The LEVEL 2 source code can print small images. As you will see in the video, you can browse the image and then the Bluetooth printer will print it. Please note that you have to pair your Android device (in your Bluetooth settings) and Bluetooth printer before running our source code. You can get the source code by following the source code above. But isn’t it more convenient if you can just download the complete source code we used, import it and play around it? There’s a small fee in getting the complete source code, it is small compared to the value, skill upgrade, and career upgrade it can bring you, or income you can get from your android app project or business. Download the source code by clicking the “Buy Now” button below. What will you get? The source codes and free code updates! LEVEL 1 is the complete source code of our tutorial above. Here’s the source code version where you can print images (see output video demo on section 3.0 above). The source code can let you browse an image and then print it in the Bluetooth printer. Images must be small and less than 10KB in size only, anything more than that, the printing will fail. This means you will download LEVEL 1 and LEVEL 2 source codes above at a discounted price. IMPORTANT NOTE: This code was only tested with the printer we specified above. It may not work with your kind of printer. We provide the code as is. Download it at your own risk. Also, thanks to a code from project green giant for helping me figure out this Android Bluetooth printing code example. 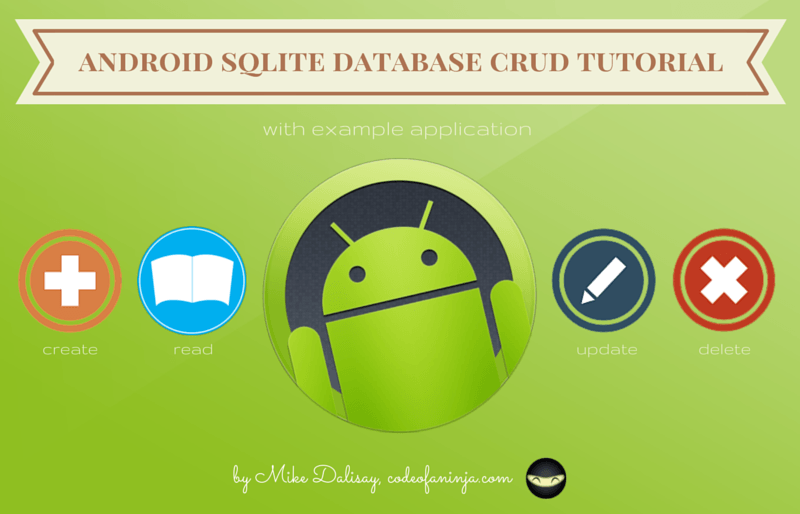 This is a step by step android CRUD tutorial where we’ll create an Android application that demonstrates Android’s SQLite database capabilities. Operations such as create, read, update and delete (CRUD) in Android is an essential skill every aspiring Android developer must have.